So, the three exclamation marks in the title. A little random, don't you think? But I figured they'd be a little more interesting (and attention grabbing) than the typical "with a twist!". What a twist. For these are not plain strawberry shortcake cupcakes. I've been spending quite a bit of time lately devising and exploring weird and wonderful flavour combinations, and strawberry & vodka entered the fray somewhere. Helloooo, alcohol! Vodka is one of my favourite types of alcohol (heh, heh) and I love how it can be disguised as water when brought into class. (I kid - I'm a good student!) But yeah, strawberries and vodka. I don't even know how I come up with such things, but a quick search on the internet told me that I wasn't the first one. Which isn't a bad thing I guess! At least it's not totally obscure and untested and there is a higher probability of it turning out alright. Just to be safe however, only one part of these cupcakes are spiked! These cupcakes were made for a friend's birthday party, and upon being asked to bake the cake I began coming up with various cake ideas and designs centered around strawberries. And the designing; the plating! I love surprise birthday parties and celebrations. The excitement and suspense in the build-up is one thing that always gets me. Getting everyone together, putting together the plans of distraction, organising party details, cake... All culminating in a genuine look of surprise from the birthday boy/girl. It is the best thing ever. I am the worst at doing the distracting, though! I always laugh, or giggle a little too much. My very first surprise party was on my 16th birthday - I came home from school as per any other day, went up to my room and my best friends were hiding in my cupboards and in the little nooks and crannies of my room! I got quite a shock when they jumped out from their hiding places to surprise me, but it was a great birthday. I was really touched (and I'm even getting the feels now, thinking about it) for I was the only one in my group of six in a different school, and having just left a few months before I was missing my best friends quite terribly. But I'm thankful that life (and technology!) has kept us together even after all this time. We've seen each other grow up through brace-faces and embarrassing stalker moments (or what we term "closely observing"), to legality and beyond (hopefully!) And what better way to embrace legality than by infusing alcohol into anything and everything! Just like these cupcakes. I ran into a bit of problem this morning with the whipped cream, though. I over-whipped it, and it curdled. Thank goodness there was a 3 for $8.70 promotion at ntuc, and I had an extra pack of whipped cream, so I managed to squeeze out just enough cream to frost the cupcakes. It was quite the frazzle, however! At least everything else went well; and I got to relax at a great restaurant after the rush-baking! But that shall be saved for another post; hehe. I'm just thankful that I managed to finish the cakes before the party tonight! Although the actual surprise was quite a mess; for the birthday boy got back before half our guests arrived! I suppose it's the thought that counts? note: I multiplied the original recipe by 1.5x so as to make enough for everyone at the party. Cream the butter and sugars, about 2-3 minutes - until light and creamy. Add the vanilla extract, then the eggs, two at a time - there are a lot of eggs involved! Add most of the self raising flour (approx. 3/4), followed by the buttermilk, and then the rest of the flour. Do not overmix! Spoon into the cups and bake for about 18 minutes. I was feeling extra precise that day, so I weighed each of the cupcakes to ensure that they had approximately the same amount of batter in all of them. But then... I ran out of batter. So the first batch had 50g per cupcake and the second, 45. Use the toothpick test to check the doneness of the cupcakes. Using a saucepan, continuously stir the strawberries, sugar, lemon juice and cornstarch until the sugar is dissolved. Cover the pan and cook for approx. 3 minutes, or at least until the mixture becomes dark red and syrupy. Stir occasionally, but this is optional. Whip the cream at high speed until stiff peaks form. This may take about 2-3 minutes but this really depends on your mixture! The original recipe called for a 4-5 minute whipping time, but it resulted in a curdled cream so the best advice I can give is for you to just eyeball your mixture and stop when the stiff peaks form; or when it looks just about right! Also, 200ml made just enough whipped cream to frost the 24 cupcakes I had, so you might want to make more if you're feeling cupcakely generous. Poke multiple holes in the strawberries using a fork to create more holes for the vodka to soak into the strawberries with. Put the strawberries in a jar, and fill the jar with vodka until the strawberries are just about covered by the vodka. I would also recommend you eyeball this part rather than measuring it as jar sizes differ, but use the measurement as a guide. Core a hole in the strawberries using a knife (I used a butter knife), and fill it with the strawberry compote. Pipe the whipped cream on top of the cupcake. Top with a vodka strawberry. Try not to get drunk on these. But back to worms. Metaphorical worms. I woke up early today to bake an earl grey loaf cake, the first in a series I am starting called loafs of love! Basically, the inspiration for this stemmed from a questionnaire I was doing the other night. They aren't related, but well, I suddenly thought of my beautiful loaf pan and I started daydreaming. I came up with multiple flavour combinations for loaf cakes, complete with sketches of each of them... The power of imagination indeed! But, well, early morning loafing... I probably should have had my cup of coffee before I started baking, not after putting my cake in the oven, for it took me almost one whole lemon for me to realise that I was using a cheese grater to zest the lemon, and wondering why I couldn't seem to get the zest going the right way. Not to mention, strips of lemon zest were going everywhere - the kitchen table was a mess this morning. Oops. I love the smell of citrus on my fingers after baking. It's so fragrant; so fresh. Complete with the smell of earl grey brewing in the background, it makes getting out of bed totally worth it. Also, the fact that this recipe can be thrown together in a saucepan (read: no mixer required!) is another motivating factor to jump out and throw some ingredients together, create some love in the oven. One of my favourite parts about baking is the room for spontaneity it encourages, to be creative, to be daring, to just throw it in and (pray). And that is exactly what I did this morning. My lemon glaze just didn't seem to set as beautifully as that seen on topwithcinnamon's, so I decided to jazz up my earl grey loaf with some four red fruits jam I bought from London's Le Pain Quotidien. It's also my new favourite jam in the world. Big words, yes, but it's really good! Tart, but with just the right amount of sweetness to it, and berry bits inside. Preheat oven to 180 degrees celcius! Grease your loaf pan liberally with butter, as always. Steep your two earl grey tea bags into your half cup of boiling water, leave it alone. Melt your butter in a saucepan over a low heat, remove from heat once completely melted. Beat in your sugar and eggs, followed by your buttermilk and lemon zest. Remove the tea bags from the water and pour the tea into the saucepan, stir it all together. Add the flour, baking powder + soda and salt (if using), stir together until just combined. Pour the mixture into the loaf pan, and tap it against the surface of your table (I do this to remove air bubbles in the mixture). My cake baked for about 25-30 minutes, but the original recipe calls for 45-55 minutes, so I would just advise you to watch your cake and do the toothpick test (I did this at about the 25th minute and the toothpick came out clean from various points in the cake, so I took the cake out). Go with your gut! That is important. Leave it to cool for about 10 minutes in the pan, before transferring it to a wire rack. Method: Combine the icing sugar and lemon juice until a thick yet pourable texture is achieved. Pour atop cake while the cake is still warm. The cake has a nice crumb, with an earl grey flavour and a zesty tang to it. My sister felt that the cake alone was a bit dry (as the glaze didn't come out very well from the morning), hence the decision to add on some lemony cream cheese on top. I'm a firm believer in the perfect cake to icing ratio, but then again, loaf cakes just aren't your average cake. Serve warm, with a cup of tea on the side. Don't forget your slice of lemon! There's been a bit of a banana craze going around lately. Not that I'm complaining, of course. I've loved bananas ever since I started using them in almost all my breakfasts - pancakes, french toast, and my trusty morning oatmeal bowls. Also, caramelised bananas are the best things ever. And the best part is, they are so easy to make! I made this cake for a friend's housewarming party - I love having a reason to bake! Although having no reason to is just as good, hehe. I took a while to decide what cake to make, as I was absolutely bursting with ideas and simply couldn't decide! Inspiration struck at the dinner table while watching my grandparents eat some bananas for dessert. Set out to buy a bunch of bananas and didn't look back. I've made this cake once before, but in a loaf tin. I halved the recipe, and served it with a drizzle of some caramel sauce. It was divine, and I hoped to achieve the same result with this one, despite the slight changes involved. I baked the cakes together in the same pan, although the recipe actually stated for them to be divided into three pans before baking. It probably explained the longer baking time for my cake - 60 minutes, as compared to 40 in the recipe. I probably used up half my toothpicks in those 20 minutes testing for the doneness... But hey, it's all for the cause. The cake also had some cracks on the top, as seen above - which, according to BBC Good Food, may be attributed to three things: too much raising agent (baking soda/powder); too small a cake tin; or too high an oven temperature. Layering a cake is no easy task. This is my second time making a layered cake, and this time I made the cake a day before frosting it, giving it enough time to cool and set so the layers can be seen clearly when iced. I baked all the cake in one pan, cutting it in half after letting it cool. The height of the cake was weird, though! It was too tall for a single layer, yet too short for two. But as I wanted to practice my layering skills, I went for two. I'm glad I did, though. Shall we talk about the frosting? The recipe called for a caramel buttercream, however I am a total sucker for cream cheese and as I had 3 blocks waiting for me in the fridge, of course I made a caramel cream cheese frosting! The caramel recipe is from Sally's Baking Addiction, and it is my go-to caramel recipe. It's so simple to make, and doesn't require a kitchen thermometer - something I have yet to get my hands on. I've used this recipe multiple times, experimenting with both brown and white sugar, and I've found that white sugar produces the best results. I used to use brown sugar as I thought that it produced more of a 'caramelly' flavour, but after using the white yesterday I suspect that it is the reason why my caramel has a burnt smell to it when cooking. Also, caramel made with the brown sugar tended to harden upon cooling, making it incredibly difficult to pour and use. Lesson learnt: use white sugar! Yesterday's housewarming was fun; my friend's new house is amazing! They even have a lift inside, which is pretty cool. We started on Insidious 2 following our Challenge Week adventures (when we watched Insidious 1 and found it to be quite a comedy), but only got through ten minutes of it. Oh well. The cake was rather well-received, I thought! One of his mom's friends could even identify the bananas I used, which was great because it meant that the banana flavour came through well. The cake has a nice balance of flavours, and I'm glad that I cut down on the initial amount of sugar required in the recipe as the bananas contributed to the sweetness given that they are naturally sweet. The caramel wasn't overpowering, which was good. I probably should have put the cake in the fridge after frosting the layers though, as they could have been given more time to set which would have made the cake easier to cut as well. But I was short on time, so - note to self for next time! Preheat your oven to 162 degrees celsius (375 degrees fahrenheit), and grease your 9-inch pan with butter. Cream the softened butter and the two sugars until light and fluffy, before mixing the eggs in one by one until silky. In one bowl, whisk the flour, baking soda and salt together. In another bowl, mash the bananas and whisk it together with the milk and vanilla extract. Lumps are ok.
Add the flour mixture and the banana mixture to the butter and eggs alternately, starting and ending with the flour. Beat until smooth. The smell is amazing. Pour batter into the pan, and bake in your preheated oven for about 40 minutes - or until the centres are set and inserted toothpicks come out clean. Cool on a wire rack, and relish the smell. I used a springform pan, so getting the cake out was pretty easy. Don't worry if the top looks a little wet - it's just the moisture from the bananas. Heat sugar in a saucepan over medium heat, stirring with a wooden spoon until completely melted. Clumps will form. That's ok. Keep stirring, to prevent your sugar from burning. Burnt caramel might be nice in Island Creamery's ice cream flavour, but it might not be the best idea for this cake! Add the butter once the sugar has been melted completely, and stir the butter into the caramel until it is completely melted as well. Sally took about 2-3 minutes for her butter to melt completely but mine melted in about a minute or so - use your instincts and powers of observation! Drizzle in the heavy cream, while stirring. Be very careful at this part, please. Do this slowly and be gentle while drizzling and stirring as the cool cream may splatter upon contact with the hot mixture in the saucepan, and the mixture will bubble rapidly. Allow the mixture to boil for a minute after drizzling all the cream in. After which, remove from heat and stir in your teaspoon of salt. Let it cool. Try no to eat the whole pan, no matter how enticing it is! The smell alone will tempt you. Cream the cream cheese and the butter together, for about 3 minutes or until light and fluffy. Add the vanilla extract and icing sugar a bit at a time, until just combined. Don't overmix, as you don't want it too become too wet. If it is, though, simply add more icing sugar. Lastly, pour in half of the caramel you made. Cut the cake in half, using a large knife. Be very careful! Spread a layer of the frosting (about one third to a half) on the bottom layer of the cake. Carefully, place the top layer atop the frosting. It might be a good idea to put it in the fridge first to let it set. Spread the frosting around the rest of the cake, and decorate however you want. 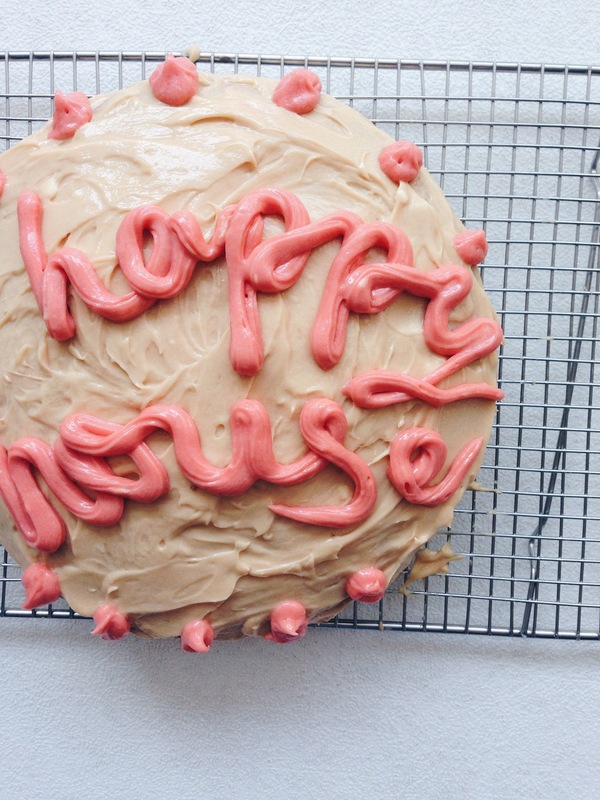 I wanted to write 'Happy Housewarming' on the cake, but I ran out of space as I used a larger tip, so I ended up writing 'Happy House'... But I do want them to have a happy house, so it all works out I guess! I bought a bottle of baileys about two months ago for a school project - my IB TOK presentation, to be precise. I know it might sound a bit weird, but listen. My presentation was about determining the extent to which molecular gastronomy could be considered an art or a science - in conclusion, molecular gastronomy is an art that uses science as a tool to create it. I had quite a bit of a struggle with this as I had my conclusion before I came up with my points; but anyway, I'm just glad it's over! With all the extra baileys left in the wine fridge, I had been toying with the idea of making a baileys cheesecake for quite some time now. However, there weren't many recipes on the internet that did not require a crazy amount of ingredients (I only had two packets of cream cheese at home, and I really wanted to use my 24-cm springform pan). I ended up having to adapt recipes and make adjustments here and there, but thankfully everything turned out alright (or so I'd like to think). This cheesecake is dense, with a strong baileys flavour which I suspect will only grow stronger tomorrow as the flavour sets in. The base is dark and lovely, albeit a little crumbly - I'm a sucker for digestive biscuit bases, or just digestive biscuits in general. Maybe a little more butter would help make it stick together better. I was kind of worried when I finished my cheesecake filling as it looked terribly wet, but my mother assured me that it was alright, and it was - in fact, I suspect that led to its incredibly creamy texture. No complaints there. Preheat your oven to 176 degrees celsius (350 fahrenheit). Grease a 24-cm springform pan. Crush the digestive biscuits in a blender, melt butter in the microwave. Mix the butter into the crushed biscuits until you get somewhat of a moist crumb. Pat into the base of your springform pan and bake for 10 minutes! Upon removing the pan from the oven after the 10 minutes, increase your oven temperature to about 232 degrees celsius (450 fahrenheit). Using an electric mixer, blend the cream cheese and sugar on medium speed until smooth and creamy (yum). Add in the eggs, one at a time, mixing well after each addition. Pour in the sour cream (or buttermilk and butter), followed by the baileys. Mix well. Pour mixture into pan and bake at 232 degrees celsius for 10 minutes, after which, lower the temperature to about 125 degrees celsius (250 fahrenheit). Bake at 40 minutes, the cheesecake will be a little wobbly in the centre but the sides should be a lovely-golden brown. My cheesecake cracked quite a lot so if you're not going for the crackly effect; the original creator of the recipe recommends putting it in a water bath to bake. I have personally never tried doing so before, but I've read that it works with great success for many, so give it a go! Remove your cheesecake and cool it on a wire rack, chill it if you wish or cut a lukewarm slice for yourself, but not before microwaving some salted caramel sauce for about 10 seconds and drizzling it over your cheesecake. Yum. Savour it, enjoy it, relish it.